There was a swarm of activity and dozens of people hanging around Todd Pletcher’s barn on the backside of Churchill Downs Sunday morning. In the middle of the congregation (Sunday, after all) was the Man of the Power Hour. On Saturday, the Pletcher-trained Always Dreaming ran away with a victory in the 143rd Kentucky Derby, on a muddy racetrack as if he was running on water (another Sunday reference, if you are wondering). Always Dreaming was never seriously challenged throughout the 11/4-mile race. He just matter-of-factly, without any drama gave Pletcher his second Derby victory. On Sunday, Pletcher looked a bit like Joel Osteen — popular and handsome televangelist. He sounded a lot more like the stately, calm, reassuring Billy Graham, the bastion of the Baptist faith. 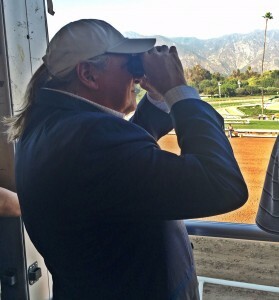 Such is the world for Todd Pletcher these days. He swept through many of the major preps for this year’s Derby, winning with this colt and that colt and running gamely in nearly all of them. Malagacy won the Grade 2 Rebel Stakes. Tapwrit won the Grade 2 Tampa Bay Derby. One Liner won the Grade 3 Southwest Stakes. Patch ran second in the Grade 2 Louisiana Derby. Battalion Runner ran second in the Grade 2 Wood Memorial. And, there was Always Dreaming, who won the Grade 1 Florida Derby. Pletcher entered the week with five possible starters for the Derby. He saddled three – thus becoming the leading trainer in Derby history with the most starts. Now, it was time to bask in the glory of winning the Kentucky Derby – the greatest race on God’s Green Earth. The joy will never go away. But tomorrow, Always Dreaming may be on his way to Maryland for the second leg of the Triple Crown – The Preakness Stakes to be run on May 20. Pletcher has never trained a Triple Crown winner. Not yet. But I wouldn’t count him or Always Dreaming out. They are both at the top of the game for a reason. They are both very talented gentlemen. Caught up with trainer Buff Bradley early Sunday morning. Went by his barn to check on his wonderful horse, Divisidero. Divisidero was in his stall, not feeling much in the mood for picture taking. He had plenty of that on Saturday, after a rousing late run to win the Grade 1 Turf Classic at Churchill for the second straight year. Divisidero’s victory puts him over $1 million dollars in earnings now. And, put Buff Bradley in the winner’s circle on Derby Day for the fourth time now in the last five years. Buff Bradley has experienced a lot of great times and winner’s circle pictures in the last few years. He trained the great Brass Hat for his dad, Fred. He helped raise and trained the fantastic filly Groupie Doll. But Bradley’s training job on Divisidero this year may rank as one of his best efforts. The 5-year-old horse started the year with two loses on the Gulfstream Park grass, which, in all honesty, doesn’t have a lot of grass on it. He ran third to Flatlined in the Grade 2 Fort Lauderdale and then sixth in the Grade 1 Gulfstream Park Turf Handicap. He sure does. He ran a huge race at Keeneland on April 9, in an allowance race, closing fast to finish second, but beating Pleuven – a very nice horse in his own right. It set him up perfectly. Divisidero was last going into the stretch on Saturday and he was seemingly boxed in every corner. Finally, jockey Julien Leparoux found a hole. And, Divisidero found the rest. He surged down the lane to beat Beach Patrol in a thrilling finish. It was probably the most thrilling race of the day. Bradley doesn’t know exactly where Divisidero will run next. But he knows where he will be. And, that is on the backside of Churchill Downs. It is Divisidero’s favorite racetrack. As soon as the gate popped open, much of his chances of winning the Kentucky Derby closed for McCracken, one of the top favorites for the 143 running of the greatest race on earth. It took about two or three strides, before he was pushed into a line of horses, sustaining some cuts on his left hind leg. Although McCracken found a good running spot, he was well off the pace on a day when you had to be close up to have a chance. Eventually, he worked himself up into contention and turning for home, it looked as if McCracken had inched up to fourth and was moving. Just like that, though, his run was done. And, he finished up 8th in the field of 20. The affable Wilkes doesn’t know exactly where and when McCracken will race again. He will be at Wilkes’ home on the backstretch of Churchill Downs. But he does know that his 3-year-old, who was undefeated going into 2017 racing will return to his best form soon. “He’s a good horse. I think he will get better the older he gets, too. I am really looking forward to later this year, and I truly think he will be much better and stronger as a 4-year-old, too,” said Wilkes. Catch all of Wilkes comments in his audio interview segment here.